When I first tasted Chinese Black Mushrooms back in the mid 1980’s, they were not at all well known in my corner of the world. They were introduced to me by a Chinese room-mate I had in my second year of law school and it is quite a few years before I ever saw them for sale in local stores. Since then, though, they have become a staple in my pantry and I would say that rarely a week passes that I do not include them in at least one meal or another. In Chinese, the generic term for this type of fungus is香菇 (xiāng gū), which translates as ‘fragrant mushroom’. 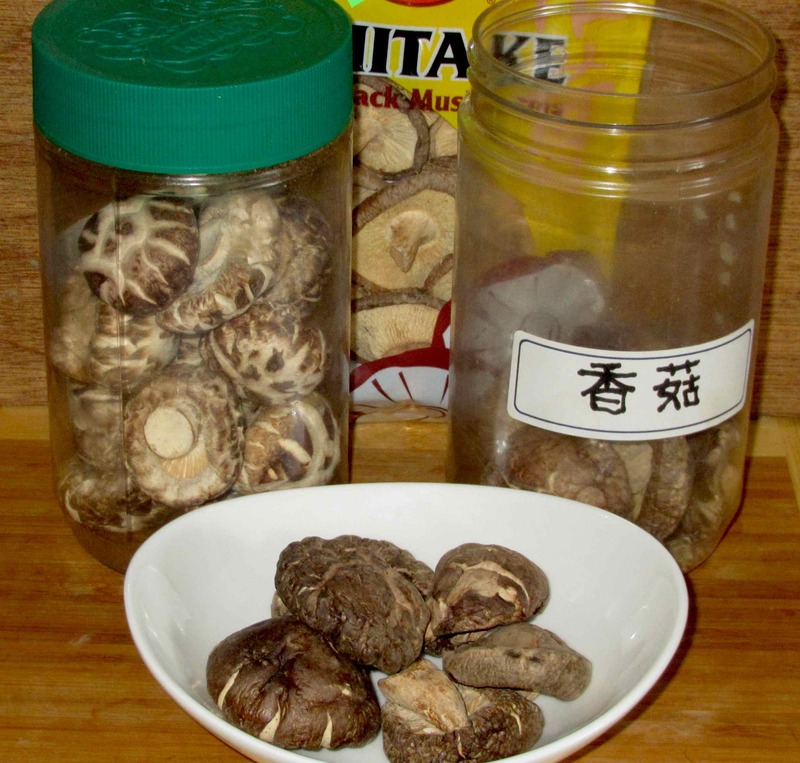 This broad group, however, is subdivided further according to quality and you will also find them sold as either冬菇 (dōng gū), or ‘winter mushroom’, and花菇 (huā gū), meaning ‘flower mushroom’. Very generally speaking, any Chinese Black Mushroom can qualify as a ‘fragrant mushroom’, while winter mushrooms (supposedly better in the colder months) are regarded as higher quality, and the ‘flower mushrooms’ held to be the best of the lot. 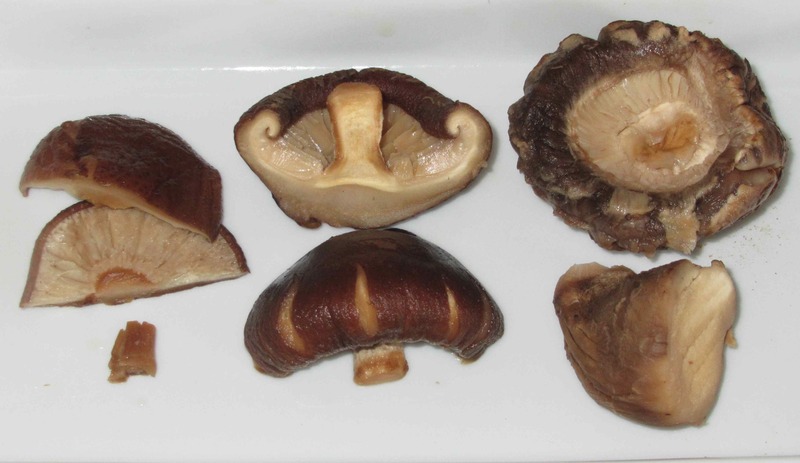 Here you can see three different grades of black mushroom. The one on the left, which we can call simply ‘fragrant mushrooms’, are exceptionally thin, with little curl at the edges and, while cheap, are definitely not the best quality. The next two, are clearly much thicker and ‘meatier’, with the middle type (a Japanese export) being of sufficiently good quality to rate being called ‘winter mushrooms’. The third kind, on the right, illustrates the characteristic ‘cracked’ surface pattern giving rise to the name ‘flower mushroom’. Supposedly, these are the best to buy (and can be expensive) but you should be aware that some unscrupulous sellers actually cut patterns into cheaper sorts. I actually rather suspect that the ones here may have had that done as the pattern seems just a bit different than other more expensive mushrooms I have bought and, though still very good, I actually think the middle variety are better. In purchasing, price is something of a (limited) indicator of quality, but thickness and aroma should be your main guides. If possible, always buy from stores where the mushrooms are available in bulk and you can feel and smell them before purchasing. Poor quality mushrooms will have a faint, dusty smell while the better ones will have a very strong aroma that is both earthy and richly redolent of meat, sometimes with the faint sort of tang you get with really fresh beef. The mushrooms need to be reconstituted before use and I find that simply soaking for an hour or so in very hot water is sufficient. Many sources, however, insist that the only proper way to soak them is in cold water overnight and it is claimed that this produces the best results. To be honest, though, I find the quicker method perfectly acceptable in terms of the end result. In either event, you can, as many cookbooks will tell you, save the soaking water for use in soups or stock but I would add the caveat that you taste it first. Sometimes, the flavor can be quite harsh, almost bitter, and, while this is okay in very robust dishes, you might not want to use it for anything more delicate. By the way, although it is not shown in the above picture, I generally use a weight of some sort (a small plate or the like) to keep the mushroom submerged as they will stubbornly remain afloat for an extended period if you do not. As they soak, you will probably notice that the aroma becomes noticeably stronger to the point that you may even be able to smell it from outside the kitchen if your nose is sensitive enough. 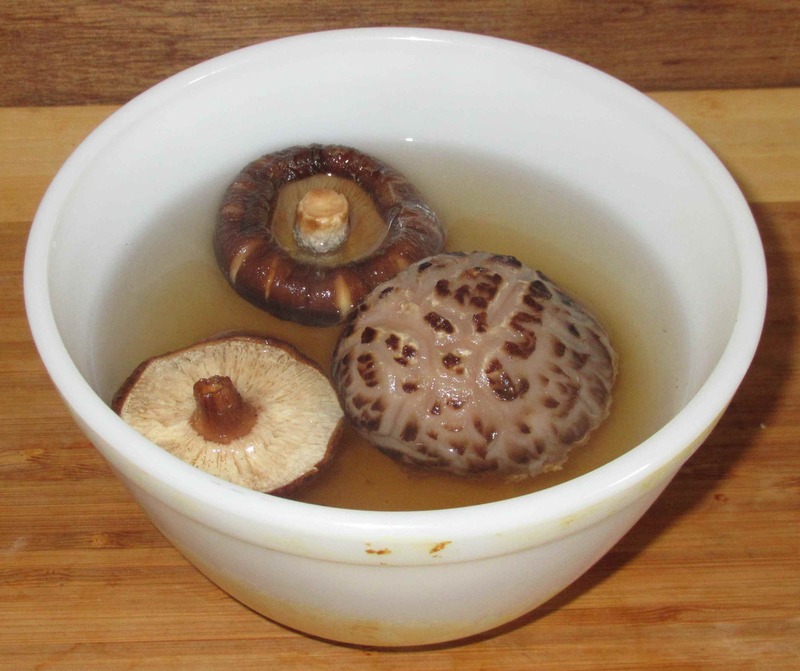 After soaking, you can use the mushrooms whole or in pieces but, either way, you need to excise away the stem as even the smaller ones (let alone the elephantine one on the left) always remain too tough to eat. Don’t throw them away, though; the flavor in the stem is every bit as strong as in the flesh and you can save them to add to your stockpot later. 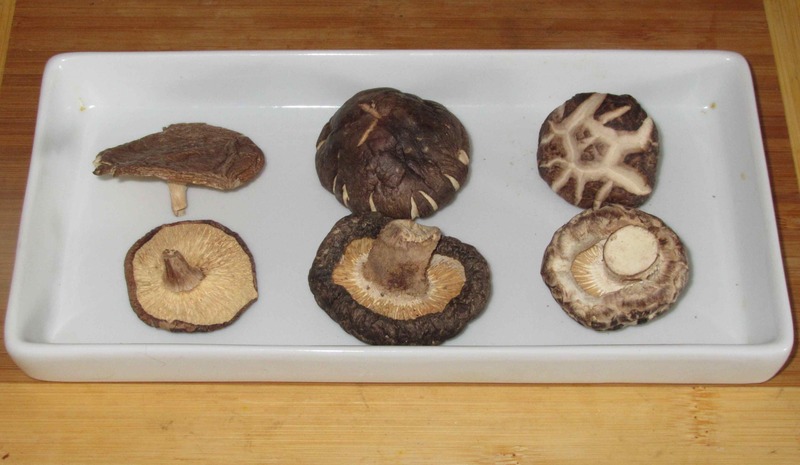 By the way, if you look closely at the mushroom in the middle, you can see some lighter patches amidst the darker brown-gray and this means that a little longer soaking is required. Basically, you can employ this variety of mushroom anywhere you would use any other kind. The fresh kind are interesting but the dried will add a depth of umami richness that is unrivalled with other sorts; a possible exception being Porcinis. Even there, though, the Black mushrooms are superior in that both the texture and flavor persists no matter the length of cooking. Indeed, it seems that, no matter how much flavor the mushrooms give up to a dish, they still retain a meaty bite and savory taste indefinitely. Thanks for the excellent info on these mushrooms! I don’t comment on your blog often, but I really enjoy these articles on ingredients, very useful. These dried mushrooms will also travel well in the arctic in all seasons … essential stuff. I’ve dried my own mushrooms to bring with me, but now that I understand these better I am going to give them a try. Thank you… I’m glad you found this useful. BTW, they are useful in powdered form too, which you can easily do yourself in a coffee grinder. My parents used to make me eat these as a child and I completed ABHORRED them, but as my taste buds evolved as I got older I started to really appreciate mushrooms! I really disliked the smell of them when they were soaking at first, now I love it. Funnily enough I love the smell of these mushrooms, but I don’t really like eating them. I find them a touch too slimy on the palate. I still cook with them and just eat around them. I never really found them slimy as such… mind you, in the bulk of the meals I use them in, they are are sliced or chopped very small. I grew up with these in almost every meal. My mom keep an entire forest of them in the fridge. Thanks for the terrific buying guide, John! Were they fresh? Personally, I love the dried but the fresh ones are not much better than regular button mushrooms in my opinion. Dried. She keeps them in the crisper. THANK YOU KINDLY..FOR ALL THIS MUCH DESIRED INFORMATION ON BLACK MUSHROOMS!! very helpful. I had a great black mushroom dish in a Chinese restaurant years ago..and have been trying to locate what kind of mushroom it is ever since. Now I see that there are many types. I found all these types except for the black flat plump kind I had..that was SO delicious. It was simply prepared with some kind of garlic sauce. Sumptious. I am pretty sure that the middle group you have pictured in the different grades of black flower mushroom above is the one. NOW to find a source to buy some. They arent on Amazon. AND, there is no China Town where I live, so looking to buy online. If anyone can recommend a good source, I would much appreciate it. and thanks again..for all the great info. Pingback: 10 toksycznych i szkodliwych chińskich produktów! Nie uwierzysz czym trują ludzi!